Knowing what happens on the home front is important in any war. How can we justly and accurately assess the historical past during wartime without thinking about the situation on the home front? I hadn’t realized it before, but how true! 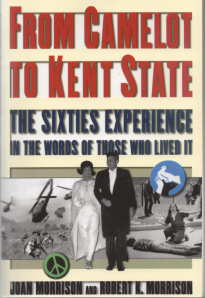 In the 1980s, my mother, Joan Wehlen Morrison, and brother, Robert “Bob” Kirby Morrison, wrote an oral history together: From Camelot to Kent State: The Sixties Experience in the Words of Those Who Lived It (Oxford University Press, Updated edition, 2001). I think that’s what Home Front Girl shows too: for the young Joan, the home front did not start on December 7, 1941, with the bombing of Pearl Harbor. It already began after World War I, the so-called “Great War,” and never let up until a “hot war” with bullets being shot recommenced. Posted in Susie's Blog and tagged 1960s, Bob Morrison, From Camelot to Kent State, home front, Pamela Neville-Sington, Vietnam. Bookmark the permalink. I see Joan’s diaries as her oral history from the late 1930s and early 1940s. Her interviewing career started when she was a teenager. Once she starts at sophisticated U-High (connected to the University of Chicago), interviewing is not exactly what she expected. Joan’s interviewing a callow youth. I got to school early this morning. . . . I planted myself in front hall and pounced on everyone who came in saying, “Describe your ideal U-High girl” . . . One of them wanted a “glamorous blonde with a slinky walk.” Hmmmm. I think my mom found that boy quite amusing! She became an well-respected oral historian with two books. She was the co-author of American Mosaic: The Immigrant Experience in the Words of Those Who Lived It (1980), recognized as a New York Times Notable Book of the Year. Dramatic readings from the book have been performed on Ellis Island, at the Mark Taper Forum in Los Angeles, and in an “In Performance at the White House” program broadcast nationally on PBS. Her second book, From Camelot to Kent State: The Sixties Experience in the Words of Those Who Lived It (1987), became the basis for a popular course on the 1960’s at the New School for Social Research in New York City. 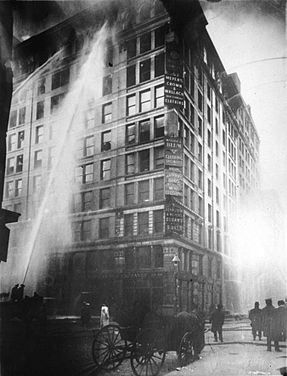 One of her most famous interviews was with Pauline Newman, the labor activist who lost many fellow workers in the Triangle Shirtwaist Factory fire in 1911. She worked with Frances Perkins, who later become Franklin Roosevelt’s secretary of labor, to improve conditions for laborers. 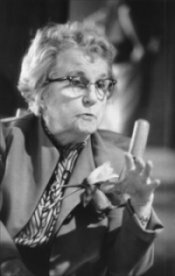 She ultimately took the role of educational director for the International Ladies’ Garment Workers’ Union Health Center, knew Eleanor Roosevelt, and consulted with the U.S. Public Health Service. One family joke is that my mom interviewed Pauline Newman twenty times in NYC, when in reality it must have only been twice. Why this overblown reckoning? My children chastise me that I never went to high school. That isn’t true. What is true is that during my high school years, Joan had to go to New York periodically to interview various people, not just Pauline Newman. We lived in Morristown, NJ, about one hour from New York. So my dad and mom and I would drive in about 1:00 in the afternoon to “the city.” While my mom conducted her interviews, Daddy and I would indulge in our favorite: double features of old movies at various movie houses in Manhattan. Then we’d meet Mom for dinner (the Copehagen, anyone?) and drive home. But to get to New York in time for the cinema and interviews, I had to miss school. My parents would shamelessly write letters excusing me from school to see the “dentist.” I must have gone to the “dentist” more than anyone else at Morristown High School in the mid-1970s. I’m not sure the administrators caught on. And I did fine in school despite my dental “woes” (aka cinematic delights). Surely only one or two of my illicit trips to NYC with my parents involved the notorious Pauline Newman interview! Recently, I found Pauline Newman’s voice. Imagine how shocked I was to find…my mother’s voice too. My dead mother suddenly speaking there. It was so eerie–and beautiful. Here is Joan’s interview with Pauline, made in the late 1970s. Mom’s interview with Pauline Newman, Joan’ s voice. Joan’s English “twin” Norah learns the ship her beau is in has been in a sea fight. Much anxiety–but also humor! Today is International Workers’ Day. I always celebrate it, even though it isn’t a big holiday in the United States. I wish it were. Joan’s father was a socialist. 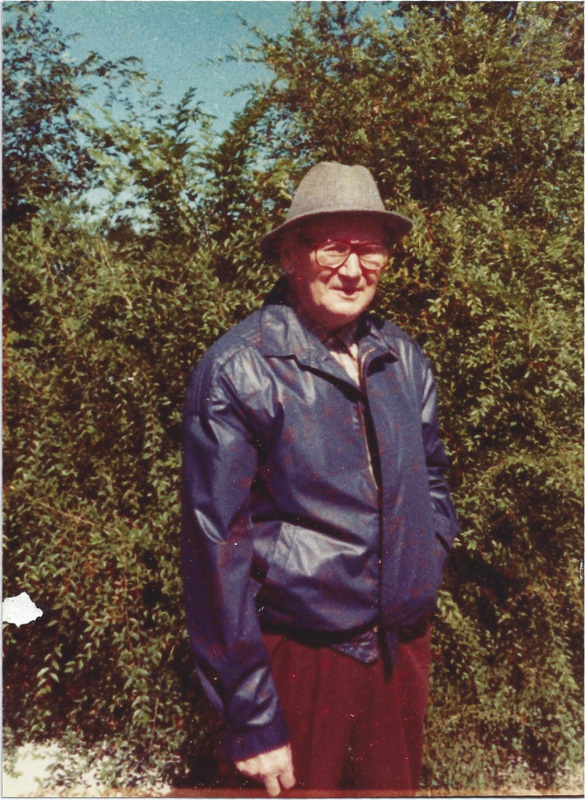 The son of a farmer and an immigrant from Sweden, Werner Wehlen came to Canada and then the United States to make a better life from himself. Joan’s father, Werner Wehlen, at age 87 after his first ride in an airplane to San Diego, California.
. . . Sunday night Daddy and I went to Bughouse Square. Not many talkers there and those not as good as they could have been. One of them was talking anti-everything and while he talked, I saw Venus shining over his shoulder. They say she is blue, but that night she was quite golden. And the man talked, sharply silhouetted against the street lamp, standing on his soapbox, the crowd like some dark elemental mass crowded below him and the great golden orb of Venus over his shoulder. The church spire in the East pierced the sky like a black rapier and the Newberry Library was a gloomy disapproving bulb in the night. It was a picture to take with you, unreal with the insects buzzing in the light and the trees moving like shadows in the warm night. Rain fell for a minute like a canvas over an unreal picture. Grant that I may know more unreal nights like that, when one can half-close one’s eyes and seem not to exist at all save as a watcher. Home and the sky was purple. Joan even jokes about being mistaken for a radical. Mr. Lucas thinks I’m a communist. Today in Study, you see, Ruth and I were—well—you know—doing Latin together. Which isn’t approved of. Then Alice asked me what onomatopoeia is and, while I was explaining, Mr. L. came over and said, “Can’t you work by yourself?” to me. “Are you helping these girls or are they helping you?” And I said, “Well, it’s sort of community work, you see.” And he said, “Well, you know we can’t have a lot of little communities in study hall.” And I said, thinking of Latin, “No, but why not one big community.” I guess he must have thought I was a communist then, ’cause he looked sort of frightened and said we’d better work alone. And I said, “Uh-huh.” And that was that. Once before he made me (and Ruth) stand in the corner for community work—me the socialist! And I had my red sweater on, too! Maybe Mr. Lucas thought she was going to break out into singing the “Internationale,” the unofficial hymn of workers the world over. Arise, the workers of all nations! Joan later enacted her socialist beliefs by becoming an oral historian who records the voices of real, everyday people. I’ll write about that more on Mother’s Day this year. The tradition of oral history lives on. My son, John, had a project in school involving oral history. They had to read, edit, and perform an interview undertaken by Studs Terkel, the great oral historian. He was a trailblazer in the field and a great inspiration to Joan in her work. John chose to perform the story of Florence Reese, an old, tough-talking grandma. She was also a trailblazer for workers’ rights. She was an amazing woman whose family of miners suffered from the cruelties inflicted by the mining companies and the U.S. government in the 1930s. But she is famous for having written a song, “Which Side are you on?”, that became a rallying cry for oppressed workers everywhere. Here it is sung by Pete Seeger. And here is Florence herself singing the song. We should all reflect on this in the wake of the financial crisis of 2008 and great economic disparity that exists today. Joan Morrison and Charlotte Fox Zabusky. American Mosaic: The Immigrant Experience in the Words of Those Who Lived It. Pittsburgh: U of Pittsburgh Press, 1980/1993, 3.